We had breakfast in the morning at the Vandalian. Porter and I are fixed to the same astrological clock of moodiness, so he was cranky that morning. I yelled to him through the order window. 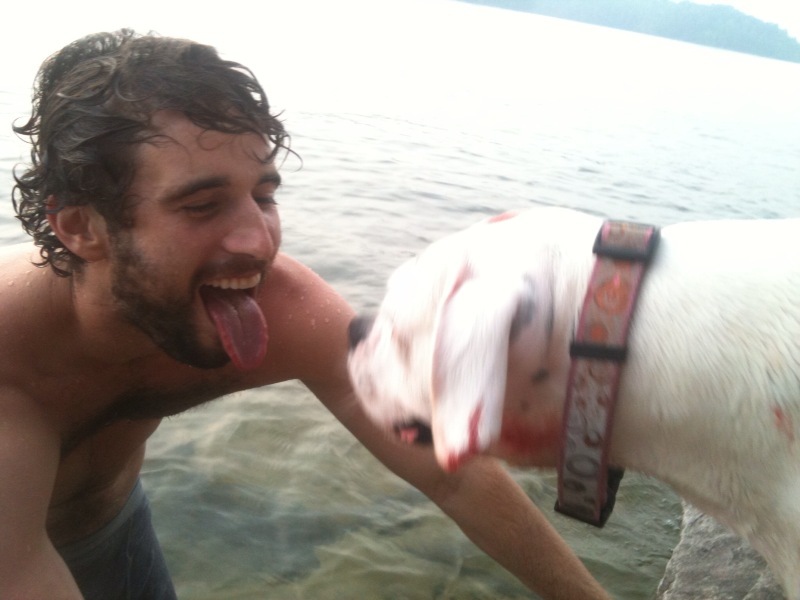 I think back to last summer, when I was swimming in the lake above the Summersville dam with Porter and Belinda, and Belinda snapping a picture of me with her boxer, Clover, as the sun set. The memory of it is happy, and laps at the mood I’m in this morning, yet I know the three of us were just as pissed at the world then as I am (we are?) now. I remember trading stories about how people complained about how Porter had equipped his routes “you go up there fucker and bolt it yourself!” and how I had run Homo Climbtastic “if you want a guide to show up with gear go hire one!” But in retrospect, the memories of those conversations just make me laugh, like the ones watching Porter smoke on one of the floaties that Kris left behind while I ate my leftover potatoes without flicking the ants off first (you can’t really taste them). After breakfast, me, Nathaniel, Laurie and Jonathan were supposed to go mountain biking, but we were one mountain bike short of four bikes, so we stopped by the bike rental shop. Nathaniel found a brand new bike on the floor for rent. “Can you give us maps to the new Boy Scout trails?” I took out my credit card to pay for Nathaniel’s bike rental. I wondered to myself if trail map mooching was a major problem at Fayetteville bike stores, although considering the bikers go into the restaurants to take whore baths, I wouldn’t put it past them. “No, you were part of the group they were angry at. The Boy Scouts are really anxious about their property. They don’t even allow people that aren’t part of their group on their other property, they’re worried about child molesters or something.” I couldn’t figure out if the group he was referring to was people scoping out the trails on foot, or the HC convention. Nathaniel wasn’t sure either. Me and Nathaniel loaded up the car. I told Laurie I had gotten a copy of the map. Laurie: “I’m going to run in and grab another copy, so that we have extras in case we split up.” Laurie ran into the shop. So we went mountain biking. Nathaniel has obviously been working out, because the last time he went mountain biking with Laurie he vomited, and this time he was going way faster than me. We pulled up in front of the bike store to return the bike. Bike store guy was hanging out on a bench. I lowered the bike rack and opened the trunk. We got in the car and shut the doors.